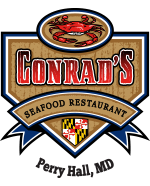 Welcome to Conrad’s Crabs in Maryland, featuring fresh fish and a full raw bar daily, lunch and dinner entrees, and the BEST in live and steamed crabs! Why? We catch our own! Tony Conrad has been a commercial waterman for the past 16 years. Captain Conrad is able to bring his crabs right off the boat and offer them directly to you! We have earned a reputation for always doing things the right way. That means using time honored techniques, the finest ingredients, and handmade preparations to showcase the rich seafood cooking traditions of Maryland. 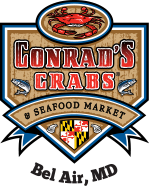 Conrad’s Crabs offers high-quality Maryland seafood at the most affordable prices in the Baltimore area. For your satisfaction, our family owned restaurant provides excellent customer service from our friendly and knowledgeable staff. 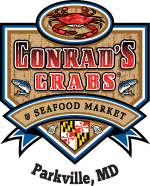 Whether you are in the mood for a great salad, steamed shrimp, or some steamed crabs, Conrad’s Crabs is just the place for you.